This article is for IT admins planning to deploy the OneDrive sync client and wanting to estimate the network bandwidth users will need for syncing. If you're not an IT admin, follow the steps in this article to limit the network bandwidth used for syncing your files: Change the OneDrive sync client upload or download rate. Follow these steps to estimate the bandwidth that will be used when you fully deploy the sync client. Assess the number of users and computers per user to which you'll deploy the sync client. Each installation multiplies the bandwidth used, so a user who has 3 syncing computers uses 3 times the bandwidth as a user who has a single syncing computer. Assess the available bandwidth and network conditions. Measure the network utilization of the sync client for a pilot group. When you deploy, Control sync throughput. You can leverage tools like Microsoft Message Analyzer or third-party speed test tools such as Wireshark or Fiddler to understand the actual download and upload throughput that the users experience. Packet loss, latency, and other factors can also impact OneDrive upload and download experience. For example, a high-latency network or network experiencing a lot of loss could result in a degraded OneDrive upload and download experience even on high bandwidth networks (1000 Mbps, for example). The loss and latency will likely vary based on the number of users that are on the same network and what those users are doing (downloading or uploading large files, etc). The bandwidth used by the sync client is predominantly file upload and download traffic and is usually closely correlated with file size and the number of files being synced. Therefore, the bandwidth used depends on the number of files in the user's OneDrive and in SharePoint document libraries they choose to sync, multiplied by the size of files, and then by the rate of change of any file. Other sync client traffic (such as checking for file changes and checking for app updates) is minimal. Estimate the number of files, typical file sizes, file types, total size of each library, how frequently files are modified, and how frequently new files are added. 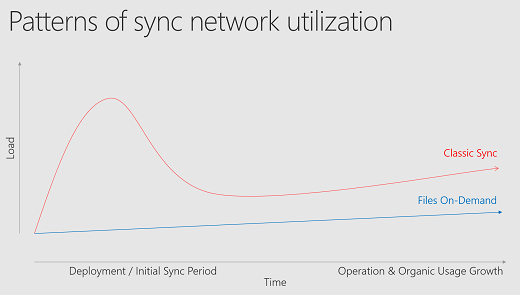 Evaluate network utilization during each sync state as described below. Use the measurements from the pilot group to extrapolate the entire organization's needs and re-test to validate the estimations. Each organization is different. When users download locations for the first time, bandwidth usage will spike. To avoid this spike, enable Learn about OneDrive Files On-Demand. This allows users to browse their files in File Explorer without downloading them. After the initial sync is complete, the network usage will decrease and then level out. Network usage varies depending on file types most frequently synced. When users change Office files, only the changes are uploaded or downloaded and not the whole file. For other types of files, the whole file is uploaded or downloaded. You should expect traffic to be higher during regular work hours when users are online and working on files. A spike in upload traffic is expected if you deploy the Known Folder Move setting in your organization. If your organization is large and your users have a lot of files in their known folders, make sure you roll out the Group Policy objects slowly to minimize the network impact of uploading files. If you need to control sync client traffic, we recommend using your network quality of service (QoS) policies or Windows QoS policies when possible. They provide better control over sync client traffic on your network. If you can't use these policies, you can use the network throughput policies provided by the sync client or let users choose their throughput settings. For info about the network settings you can make available to your users, see Change the OneDrive sync client upload or download rate. Assign differentiated services code point (DSCP) values to network packets originating from the OneDrive sync client to enable appropriate handling of the traffic by your network devices. Limit the maximum upload throughput rate that the OneDrive sync client can reach. To define the priority of outbound network traffic, you can configure a QoS policy with a specific differentiated services code point (DSCP) value. Network routers use the DSCP value to classify network packets and determine the appropriate queue. A higher value indicates a higher priority for the packet. The number of queues and their prioritization behavior needs to be designed as part of your organization's QoS strategy. To manage the use of network bandwidth, you can configure a QoS policy with a specific throttle rate for outbound traffic. With throttling, a QoS policy will limit the outgoing network traffic to a specified rate. Browse to the location where you want to create the new policy. For example, if all your client computers are located in an OU (Organizational Unit) named "Clients" then the new policy should be created in the "Clients" OU. Right-click the location, and then click Create a GPO in this domain, and Link it here. In the New GPO dialog box, enter a name for the new Group Policy object in the Name box (for example, "OneDrive sync client") and then click OK.
Right-click the policy and then click Edit. In the Group Policy Management Editor, expand Computer Configuration, expand Policies, expand Windows Settings, right-click Policy-based QoS, and then click Create new policy. In the Policy-based QoS dialog box, enter a name for the new policy in the Name box (for example, "OneDrive sync client"). Select Specify DSCP Value and set the appropriate value between 0 and 63 based on your organization's QoS strategy. In the Outbound Throttle Rate box, enter a rate in KBps and click Next. Select Only applications with this executable name and enter "onedrive.exe" to apply the QoS policy to only the OneDrive sync client process. Click Next. Make sure that both Any source IP address and Any destination IP address are selected and then click Next. These two settings ensure that packets will be managed regardless of which computer (IP address) sent those packets and which computer (IP address) will receive those packets. In the Select the protocol this QoS policy applies to list, select TCP. Leave from any source port and to any destination selected. Click Finish.